A Dedication to Rollo, Archer and Sir Gawain. At the time Siggy was killed by Harbard’s hand on the ice, Rollo was unaware. After her death, she was named a ‘hero’, because she had saved Ragnar’s children from the ice. When Rollo came home, he heard the news of her passing and was heart-broken. He fell into a slump, unable to move on and went through the days drinking his sorrows away. He was seen as a traitor, so why was he still alive by the Gods? When Lagertha visited him after she returned in Kattegat from Hedeby, she found Rollo completely wasted in his home. She woke him up in a specific way only she knew, due her experience from the past. Their past went way back to their teenage years. Back then, Rollo hadn’t known that Lagertha would choose for his brother Ragnar, one of the many suiters she could choose from. Lagertha had always been perfect in many ways. Everyone in the small village loved Lagertha since she was young, as she was fierce and strong. Already a true shield-maiden at a young age. Rollo was the youngest of the family Lothbrok. He had met her after a training session in another village, about an hour on horseback away from where he lived. She had loved Rollo when she had seen him train. He had been kind to her. His fighting skill had looked as if he was a great warrior, but during battle he hadn’t been able to fight her. She liked the idea of being strong, that she could handle anything and if she wanted, to leave every men behind and be on her own. “Rollo, wake up. I’m here now. Mind telling me why you’re throwing your life away?” Though not completely awake, Rollo heard her question, yet didn’t reply right. Instead his body started to tremble. Lagertha saw it happen and stroking with one hand through his hair. “It’s alright. Cry. It will help you cope with Siggy’s death.” At her words, Rollo turned around. She saw his tears and tried to comfort him. After his body stopped trembling and she saw that he cried no more, she continued to speak. Lagertha didn’t want to hear any of it and said: “our Gods don’t want you at their side yet, since you still have so much to live for. I don’t believe you truly mean the words you’re saying. I will see you later. Bjorn will be there. He needs you, since you can teach him so many things still. I mean it, Rollo. I will see you in a few hours. 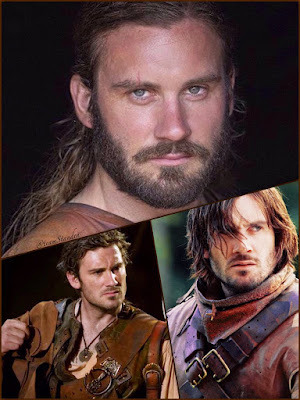 I will send Bjorn to fetch you.” Rollo turned around, gave her a kiss and fell into a restless sleep. His dream following the conversation nearly seemed real to him. He was told in his dream that Harbard first thought that he was the God Odin, but he turned out to be Loki. He knew what happened to Siggy. To his surprise Siggy told him that, after his talk with Lagertha, he needed to come to the lake. There he would be promised a future, a life better than the one he had now. When Rollo heard this, he understood the secret she carried, as the family had always thought that Bjorn was the son of Ragnar. Would Bjorn turn out to be his son after all? Was he still dreaming? Wake up, Rollo! For God’s sake, wake up! He was shocked by the discovery that he might be a father. He didn’t understand any of it. The seer had told him that his future lies in Paris, not in Kattegat. Was he supposed to keep Bjorn in Paris as well? Was all of it a distraction to give him a sense of purpose in his life? To change his fate? What did she want with this message? He went to the frozen lake where Siggy had died while saving Ragnar’s other children. But nothing happened. Before they went to Paris, he trained with Bjorn every day. And every day he went to the lake. But every time he came home without anything happening. To great displeasure of Rollo, as he had expected to see a sign of life from Siggy, so she could go to Paris with him. But time and time again he was disappointed. His clinging hope to see her was a reason to forget about her, for the pain was too much to bear. He tried desperately to forget, but he found that he couldn’t. In Paris, he fell down from some meters high, because he got distracted by a Francoise. Then something strange happened. As he fell, he was lifted up and the lake in which he had fallen froze. While the lake froze, he saw Siggy’s face “Siggy why did you turn up in this lake?” Her face faded as the ice became thicker. She held a sword in her hand. After the lake was frozen solid, Rollo walked towards her on the ice to grab the sword from her. When he did, he suddenly found himself in a different time and place. Gawain took the sword Excalibur from Excalibur’s hand after the lake was frozen solid, so he could give the sword to Arthur. Gawain had to take the sword instead of Merlin, for he kept the lake frozen with his magic. Gawain got the sword. When he reached Merlin to hand over the sword to Arthur, when they went back to the city of Camelot, he noticed that a large crowd had gathered around Arthur, and that he had gained a large number of new warriors in the main time. Gawain was asked to give each and every one the right training, so they could form an army together with Arthur. He had already started training the new recruits, some of them where knights of the round table. Now he had to train more and in different forms. He was knighted that night for his courage and as trainer of the royal guard. As he sat at the banquet during one of the parties at Arthur’s, his eyes fell on Ragnelle. Ragnelle stood out, but not because she was beautiful. Gawain didn’t care much for her looks. He expected that she was cursed. By marrying her he sought to break the curse. He had always thought this, but when the curse wasn’t lifted he held no regrets. She was honest and loyal to him. She did everything he asked for. After they had lived in sovereignty for a couple of years, Gawain found a potion to lift the curse. He brought it to Ragnelle. Finally, after all those years, the curse was lifted. While he fell asleep, something happened that no one had ever dared to dream. He woke up next to a gorgeous woman. Unfortunately, Arthur needed him to defend the castle from king Lot. After king Lot was defeated, he went back to Ragnelle, who was glad that he hadn’t died during the war. Mostly because king Lot had a strong and loyal army and king Lot was no push over either. After Ragnelle had given him a warm welcome, he went to bed for he was exhausted. In his dreams, he relived the war. He took his sword to attack, but noticed soon enough that he was fighting in a different kind of war. A war he had never fought, but used a strategy that he had used during the war they just won. After Archer had been captured, he was freed by his brothers although his brother and half-brother. Yet, they all had to fight a war with the oldest sheriff of Nottingham. Isabella had asked the help of Robin Hood and Guy Gisborne. They couldn’t refuse her call of need, the sister of Guy. What they didn’t know, was that Archer would lead them straight into a trap. Archer realized that the trap wouldn’t work and that he needed to save Robin and Guy (his brother and half-brother) from his sister Isabella. However, after they were freed, Archer had to learn to cope with the fact that his brothers were dead. He finally had found his family. He wanted to create a bond with this family of outlaws. Now he felt betrayed by his sister, she who killed his brother and later his half-brother with a poisoned sword. After he joined the outlaws, he was given the next task: burying Alan. He gave a funeral. Alan lying in a boat on the land that was set ablaze by Archer’s burning arrow. The boat was consumed by flames and disappeared. Lots of boats were set ablaze for the funeral of the first Vikings who didn’t survive the raid in Paris by doing that they will please the Gods in Valhalla, as that was tradition during that time. Rollo was together with his comrades during the funeral, the first Vikings who didn’t survive the war in Paris. Ragnar had new ideas, but first he had to process this great loss. When Rollo heard that his brother was sick and on his deathbed, he rushed to his brother’s side. There he was laid in a closed coffin. Everyone was present to mourn. However, it was all a trick to get into Paris and start a successful raid. After that raid, someone needed to stay behind. A lot volunteered, but Rollo had a motive to stay behind in Paris. Weeping he had said his goodbyes to Lagertha and Bjorn. But when his brother gone, he was already on his way to negotiate with the princess’ father. He would betray his brother again, just like he had done before.